​Anna shares what she learned about the famous artist through the summer and fall of 1976 and into winter 1977, when she worked as O’Keeffe's weekend companion in her two New Mexico homes. 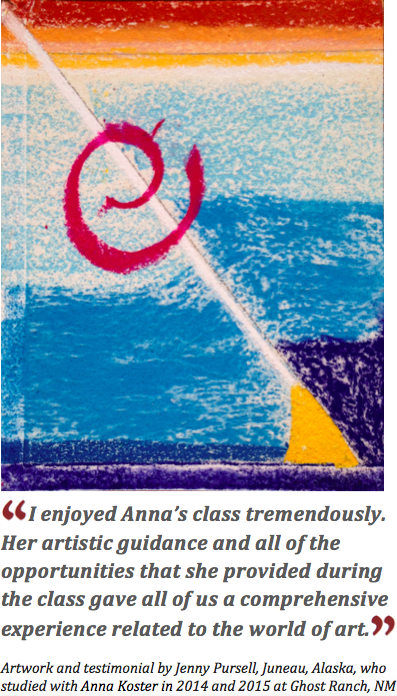 Between Anna’s personal experience and study of the artist and Anna's work in the years that followed, she gained a unique perspective on O’Keeffe’s life, her art practice, and lessons that all artists can take to heart. The talk will be illustrated, and there will be time for questions. Learn more about Anna Koster and Georgia O’Keeffe at www.annakoster.com. ​Anna had the opportunity to serve as Georgia O’Keeffe’s weekend companion in 1976. She went on to earn a Master of Fine Arts degree in 1983, and she taught at the San Jose Museum Art School, Community College of Denver, Denver Jewish Community Center and other venues through the 1980s. At the same time, her career as an artist progressed with solo and group shows. Then she began working in art museums, leading her to Stanford University’s Cantor Arts Center, where she retired as Head of Communications in 2016. After a 35-year museum career, Anna is focusing on her own art as well as teaching and writing about art. Anna has conducted annual workshops since 2014 at Ghost Ranch, at the Georgia O’Keeffe Museum, both in New Mexico, and in California at the Palo Alto Art Center and San Jose University Art. Anna's next workshops at Ghost Ranch are "Beginners: Find Your Inner O’Keeffe and Find Yourself" (March 14–18, 2019) and "Painting in O'Keeffe Country" (September 8-13, 2019). Learn more at www.annakoster.com. See Anna's resume at www.annakoster.com/resume. For more information, call 650-280-0975 or visit ______________.